I didn’t intend to buy more rhubarb this week, but my favorite farmer ran out of ones so we agreed that I’d just take my change in rhubarb. Pretty good up-selling strategy. Think he learned that in farmer school? Also, DUH, I should have taken my change in extra morels! This entry was posted on May 28, 2011 by Megan @ When Harry Met Salad. 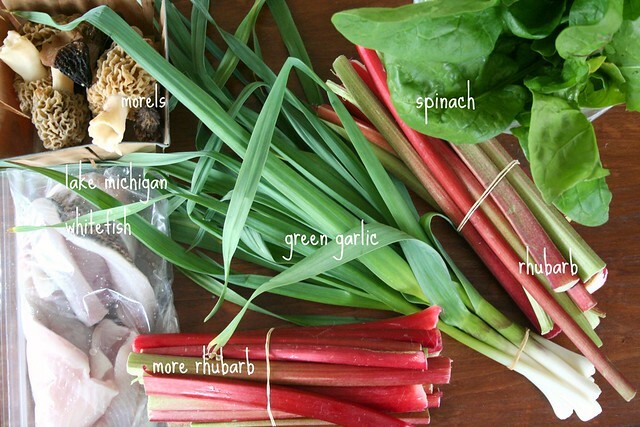 It was filed under farmers market and was tagged with farmers market, fresh produce, green garlic, morels, rhubarb, spinach, spring, whitefish. You are absolutely amazing. I have been blown away by your photography and posts every time. Oh, thank you, Donna! How sweet. Lovely! What did you do with the whitefish fillets? I made fish tacos with rhubarb salsa. Rhubarb salsa! More on that very soon. Love the true seasonality of this blog – beautiful!